Authorize.Net FAQs for Vend Ecommerce – How can we help? Where do I set up my Authorize.Net payment in Vend Ecommerce? Where do I find Authorize.Net login ID and transaction key? What is the Sandbox Switch? Do you support test mode? 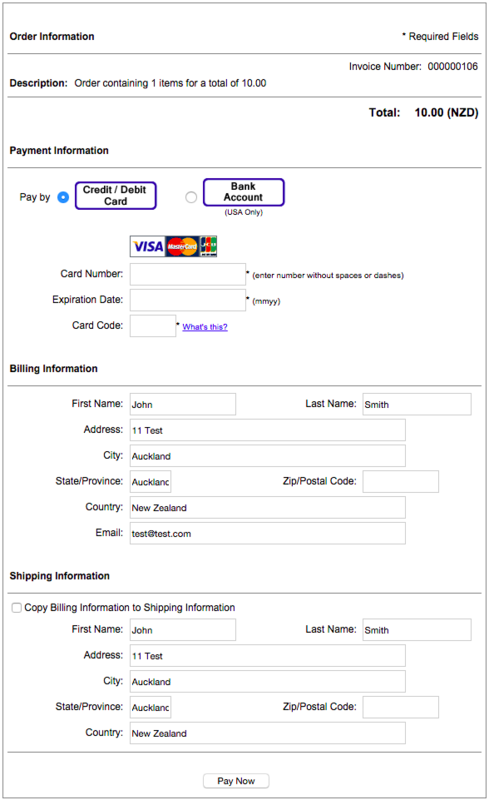 How do I configure the payment form that customers see when they checkout? In Vend Ecommerce, navigate to Settings -> Payment Methods and select 'Authorize.Net SIM' from the gateway dropdown menu. Here you'll need to name the payment method, choose which Vend payment type to map it to and input your Authorize.Net login ID and transaction key. To find your Login ID and transaction key, check out this Authorize.Net article here. When setting up or editing your payment settings in Vend Ecommerce you may notice a 'Sandbox' switch. This should remain switched off unless you use a sandbox account account created via this page here. 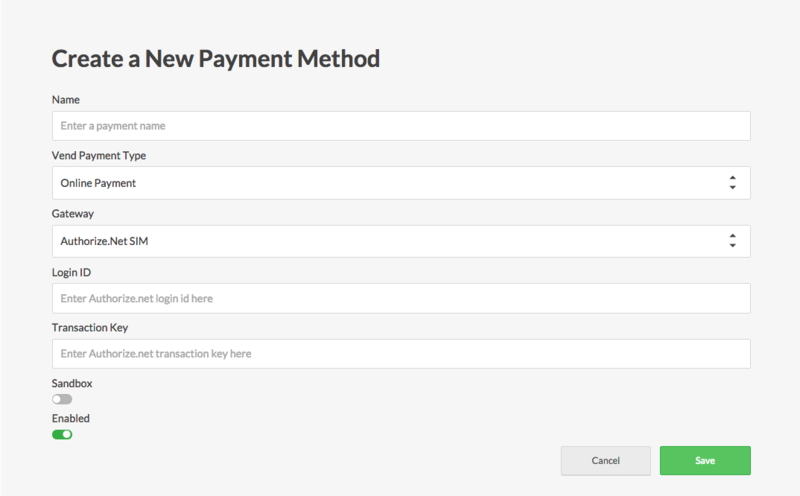 To ensure that the Sandbox switch is turned off, navigate to Settings -> Payment Methods in Vend Ecommerce, select your Authorize.Net payment method and check that the sandbox switch is grey. If it's green, click it to switch it off and select 'save'. We do not support test mode in Vend and therefore you will need to ensure that test mode is disabled for your Authorize.Net account. Login to the Authorize.Net Merchant Interface here. Navigate to 'Account' in the left-hand menu and select 'Settings'. In Security Settings, Click 'Test Mode'. Click Turn Test OFF to take your account out of Test Mode. 1. First up, head to https://account.authorize.net and sign in to your Authorize.net account. View: By selecting View, the customer can view but not edit the information. 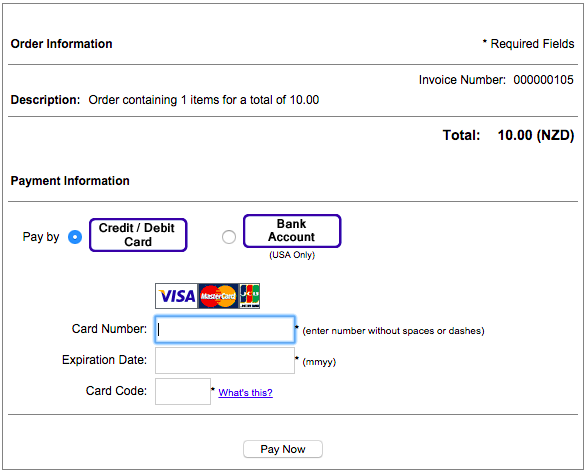 This is useful if you'd like to display an invoice number on your payment form for example. Edit: By selecting Edit, the customer will be able to view and edit the information but it is not required that they fill this field out. This is useful when you want to collect additional information from a customer such as email or phone number, but don't neccessarily require it. Required: By selecting Required, the customer must must out the field in order to submit the transaction. 5. Once you are happy with everything, click submit. What fields should I select for the Payment Form? There are certain fields available on the Authorize.net payment form that won't be auto-filled by Vend Ecommerce such as customer phone number or fax number. If you want the customer to provide this information you can select it in the Authorize.net Payment Form but it will mean that the customer will need to provide this information. Option 2: Long form option that includes customer address information that will be auto-filled from Vend Ecommerce.